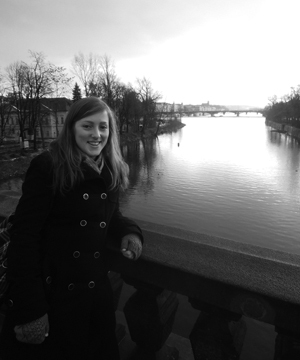 Alyson Coombes obtained a BA in French and German from Royal Holloway, University of London, with a year abroad divided between Braunschweig and Lyon. Realising that German was her true passion, she specialised in this language in her final year. After graduating, she worked as an in-house proofreader and translator, but left this role to study for an MA in Literary Translation at the University of East Anglia, working as a freelance German translator alongside her studies. Her interest in literary translation has continued to grow whilst studying over the last year, and she maintains a particular interest in literature relating to the Holocaust. Spurred on by winning a place on the Emerging Translators Programme in 2015, Alyson is keen to translate contemporary German-language novels in the future. During my stay in The Hague I turned 31. Strangely, my 31st birthday feels much more significant than my 30th. To mark my growing older, I recreated one of my most formative childhood memories with my daughter. We watched an animated film together. The Soviet cartoon Chipollino was created in 1961, based on the children’s book by Gianni Rodari (Le avventure di Cipollino) and directed by Boris Dezkin. Chipollino (from the Italian word ‘cipolla’, meaning ‘onion’) is a dialectical analysis of societal relationships, embodied by fruit and vegetables. Other injustices follow: the hut in which the pumpkin lives is confiscated on the grounds that it was built illegally. A guard dog is placed in the hut and tasked with reporting anyone who seems suspicious. The vegetables become radicalised, and Pumpkin and Chipollino’s other friends go underground. Using trickery they manage to take back Pumpkin’s hut and hide it in the forest, and Chipollino’s father is rescued from prison too. Prince Lemon and his henchman Tomato tighten their control and start a manhunt that bears many similarities to today’s dragnet techniques. A renowned investigator is brought in from abroad and the aristocracy (the cherries) flee the kingdom as a precaution. Chipollino and his helpers are captured along with numerous other innocent citizens. Sheet music is confiscated on the pretext that it is a coded message and Pumpkin’s hut is discovered in the forest. Incidentally, the brilliant film score was composed by Karen Surenovich Khachaturian, a student of Shostakovich. The aristocratic cherries are two old maids who are Siamese twins, or cherries joined at the head. Their nephew the young cherry is a sensitive, thin, trusting boy who wears shorts. Needless to say, he betrays his aunts and joins those fighting for the revolution. In a Greek tragedy he would have paid dearly for this betrayal and Freud would have taken a greater interest in his aunts, but communism only rewards him. Everything works out well in the end, of course, which in this case means world revolution and the building of a new and fairer society. The tomato bursts, the cherries remain abroad and everyone sets to work. I have always had something against the little onion and I’ve spent the last few years wondering what it could be. On the other hand, I have a lot of sympathy for the little cherry, maybe because he looks so fragile and intellectual, whereas the hero’s appearance is somewhat rougher. Perhaps he simply seems less threatening. I watched the film for the fortieth time anyway and, just before the happy ending, my daughter fell asleep. I spent a lot of time yesterday thinking about literature festivals and book fairs, and the contrast between the two that makes people fly home from a festival feeling cheerful but leave a book fair contemplating suicide. I love literature festivals, but also bookshops and libraries. My mother fed me with books – they were my sustenance and the basis of my upbringing. When I was nine she gave me Feuchtwanger, at ten it was Balzac and Hašek, later Kafka and Zweig. Feuchtwanger replaced religious education in our household and I’m afraid I learned too much about love affairs from Stefan Zweig’s Letter from an Unknown Woman. I could hardly believe my luck this morning as I travelled to the airport in the same bus as the legendary Abraham B. Yehoshua. Sitting next to him was surreal, talking with him even more so. Book fairs, however, are a different story. I believe these places actually have very little to do with literature; at least that’s true of the largest book fair, held in Frankfurt. Here, foreign rights are negotiated, prizes awarded and new trends established. Agents and publishers are always whispering about how this is definitely not the place for authors, and I’m afraid they’re not entirely wrong. Frankfurt is primarily about business, which doesn’t fit in with works of fiction. Book fairs are unhealthy, tiring and incredibly consumable. New literature is not discovered here, all readings are done in passing. The attention span of the audience rarely exceeds ten minutes. And yet a fair, just like a festival, somehow resembles a big adventure playground with a hint of a school trip. Every year you encounter people from all over the world, foreign publishers, agents, booksellers and journalists. In the aisles, people arrange to meet for coffee or to attend one of the many receptions or parties. Towards the end of the fair, the nights grow shorter, the circles under your eyes darken and everyone becomes increasingly silly. The traditional Jewish saying that concludes the Passover Seder is ‘Next year in Jerusalem’ – at the book fair, you know in all likelihood you will meet each other again the following year. A very German detail is, moreover, the surplus of manga kids – both in Frankfurt and Leipzig, flocks of youngsters in homemade manga costumes edge through the narrow aisles. I must admit, the sight of them can be ludicrous; as is so often the case, the best scenes occur in the queue to the ladies’ toilets – chubby teenagers paint their bodies in blue colours, straighten their Hobbit ears and plastic tails next to thin, older women who apply their Chanel lipsticks and attempt to engage the youngsters in philosophical discussions about fantasy. Sadly, I don’t know what they’re doing at a book fair; in the past, those dressed up would be granted free entry in order to lower the average age for the statistics. This was a fantastic festival, and I would like to thank everyone who made this experience possible and produced wonderful translations of my texts every day. At last! The festival has begun, and it really does have an air of a successful school trip. I don’t actually have particularly fond memories of my school days, and for the most part I’ve forced myself to forget the school trips too. School as an institution fosters incredible feelings of humiliation and failure, and raises questions of identity. School trips always promise a brief escape from this futility. This trip to The Hague is better. Much better. Every five minutes you bump into an old acquaintance in the foyer and greet each other with a hug, genuinely pleased to see one another. There’s the great Nino Haratischwili, who last year released the unique and outstanding novel Das achte Leben (The Eighth Life), which recounts an entire century of Russian, Soviet and Georgian history. The story is centred on the Jaschi family, whose members include dissidents as well as communists loyal to the regime. Several generations founder as a result of their own faults, the various systems, the family, and love. The story also covers Georgia in the 1990s, a time which few have dealt with in the past. Like many periods of history in the Caucasus, this was a dark chapter which remains far from being explored or even described objectively. Unfortunately, this is also the time in which I grew up, so this story is particularly close to my heart. It is brutally honest, historically accurate and well researched. Nino Haratischwili succeeds not only in conveying feelings and mentalities, but also historical facts which, in our time in particular, are willingly swept under the carpet of memory. The no less brilliant Nir Baram enjoys similar achievements. His latest book describes life under both National Socialism and Stalinism. It’s the ‘Russian’ part that has been etched in my mind more than anything. A scene in which a young Cheka employee, forced to betray her own family, interviews an old friend of her parents at the security organisation headquarters – he is supposed to confess, but instead pours boiling water over her hand. And then Saša Stanišić! Phenomenal, flawless books which I will never forget, and which even moved my mother to tears; from the story of young Alexander who survives the war in Bosnia to the wonderful novel Vor dem Fest (Before the Feast), which describes a single day in a village in Germany’s Uckermark region. And we mustn’t forget the brilliant short stories by Karen Köhler or the beautiful debut novel by Mirna Funk. We cannot take all this for granted, in light of the events in Paris last night and in Beirut the night before, or those across Syria and Baghdad this morning. There is of course a very different atmosphere in The Hague now too; even the sky is no longer bright blue, as in previous days, but rather a rainy grey. When you become a mother you undergo different kinds of metamorphosis, physical of course, but also psychological. You are confronted with limitations you never even imagined existed. Yet there’s one change that, whilst expected, has overwhelmed me with its intensity: the metamorphosis of the working woman. It begins with editors who say things like ‘We’ve put a question mark by your name for now, as you’re pregnant,’ and then moderators who declare at readings that of course you’re no longer writing now you have a young child at home. Event organisers who come out with sentences such as ‘Well, the event’s all about networking; you don’t have to come, just go for a walk with the pram.’ Does this happen to men too? Probably not. Next time I write, I’m going to carry out a representative survey of the fathers at this festival, but I think in their case it’s more often sweet and cute that they are looking after the little ones. Some people even get carried away and stroke the child’s head. Fortunately, most of them now refrain from offering sweets. A literature festival is, of course, an extreme case (at last you’re allowed to bring the pram, and you may not even be the only one) – and as ever you have good experiences, where you are welcomed with your child and taken seriously as an author, and where the child is not held against you because of your gender. There are of course other less successful occasions; the festivals you immediately want to leave again and certainly would never have attended if you’d known you wouldn’t be able to join in with the dinners or events anyway because you’d ruin the group dynamic. The new Canadian Prime Minister says it’s 2015, but I feel as though I’m still in the 50s. I don’t know where the idea comes from that giving birth makes you lose brain cells. I don’t know why people still try to disempower women when it comes to motherhood: either because they don’t have children and therefore can’t want them, or have them and still work, or don’t. Fortunately, other people are happy to decide on the women’s behalf whether she should work and how much. The only thing that’s fixed is the level of child allowance and the duration of the maternity leave. One thing is certain: people think you are strange if you have children, as though you have left for social and professional Siberia, and if you have no children, as though you have left for social and ethical Siberia. Motherhood is seen as a public good, everyone joins in, everyone knows better, everyone except the mother herself. On the other hand, she now has a maternal instinct and is free to pick out a light blue or dusky pink bear. Not that I have anything against bears, even light blue and dusky pink ones. When it comes to structural problems in the job market or the art scene, most bear-lovers keep quiet. In Germany it is normal to not hire women between twenty-five and thirty-five because they might have children. Just to be on the safe side, they are paid less too. After all, you never know. But it is 2015. It’s not the women that have to change yet again, but their working conditions. These are on the public record. I’m currently enjoying the last autumn sunshine in Berlin, wondering when winter will set in. It grows colder by the day, and in Berlin this coldness extends to social interactions too. Germany does not want to share, and definitely not with newcomers. A fact that we, and those newcomers, now see on every street corner and in every newspaper headline. No wonder I’m looking forward to the approaching festival, which will be a wonderful opportunity to catch up with old friends and make new ones, and to attend exciting readings and concerts. Expectations are extremely high of course, but that’s good. In this case, at least, disappointment is unlikely. This festival in particular has a slight school-trip feeling about it – lots of friends, great readings and bands I’ve always wanted to see – a kind of teenage anticipation. I can hardly wait to return to the Netherlands. Last year, I was fortunate enough to spend a month in Amsterdam at the invitation of the Dutch Foundation for Literature, and it was incredible. One of the best springs of my life, with the promise of a summer ahead that would bring even greater things. It was not just the lovely flat in the city centre, but also my translator Josephine Rijnaarts, my Dutch publisher De Bezige Bij and the wonderfully supportive Orli Austen, who made this month such a unique experience. It’s just a shame that after the weekend it will all be over again – but at least we’ll return home buzzing with new experiences. Although the weather has already grown too cold, I sit on my balcony and look across at the ‘Teehaus Baku’ bakery. Any link with Baku or even Azerbaijan is extremely tenuous – they sell mostly Turkish bread that’s delivered at five o’clock every morning by a lorry marked ‘Backservice Hass’, along with the occasional pretzel. There are hardly even any bread rolls to choose from. I once asked if they had Pakhlava, the ultimate Azerbaijani speciality, and the shop assistant stared at me, dumbfounded, probably thinking I was an irrepressible optimist. In a quiet side street in Amsterdam, just down from the flat where I was staying, there was a tiny bakery that produced only one type of chocolate biscuit, which was absolutely mouth-watering. There was also the ‘Damascus’ bakery, a few doors up from our flat in Berlin, converted into someone’s living room, though the sign signalling the presence of confectionary and baked goods remains. These references could hardly be more ironic – Baku, the city in which I grew up, which still exists but no longer as I remember it, and Damascus, my husband’s city, which has been shut down for a while now. In any case, a lot of things in our street are just a façade. My daughter, whose trip to The Hague will be her first time abroad, was born in this neighbourhood. She doesn’t yet have a past that has been lived in another language and on another continent. Her vegetables have always tasted a little insipid, as German vegetables do, and her sky has always tended towards a dull grey. She will not be surprised that the brothel next door is always discrete about its customers, or that the bold signs in the window of the Thai massage parlour mainly state that there’s no place for eroticism inside. People from our block often spend their evenings sitting outside the Romanian delicatessen, cracking sunflower seeds and delighting in the neatly dressed and generally charming children. American artists on racing bikes shoot between them, headed for their latest projects. It’s probably the best way of getting around, but unfortunately I have a very un-Dutch fear of cycling in large cities. The traffic in our street is dominated by a single mode of transport, the M41 bus. This bus is hell itself; irregular and invariably crowded as a result, it has the most inhuman and unfriendly drivers in the whole of Germany and the passengers are on the brink of despair. But soon I too will get on the M41, squeeze my suitcase between the other passengers’ knees, and make my way to the airport.